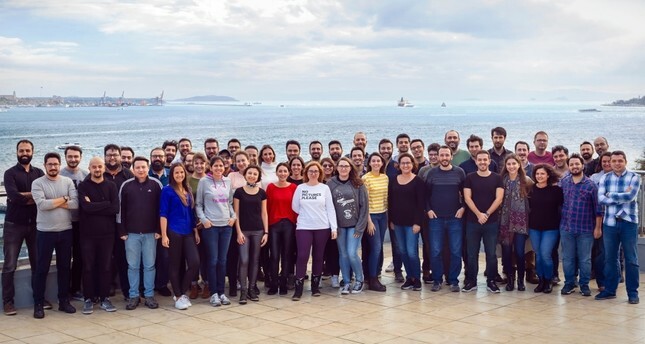 Team photo of Peak Games, a Turkish game developer which ranked 26th among 56 mobile applications with an economic size of $101 billion. App Annie, which measures figures from the mobile world economy, has released its 2019 report: 194 billion applications were downloaded in 2018. Mobile applications created a $101 billion economy. People spent an average of three hours each day looking at mobile screens. Peak, a Turkish venture operating in the mobile app ecosystem, has taken a share of this huge economy, which is dominated by ventures from the U.S., Japan, China and South Korea. While Peak is the only Turkish technology company to make it to App Annie's list, it is also noted that there is no company listed from Germany, France, and the U.K.
World technology giants Google and Apple have announced game platforms in recent weeks. Limited hardware revenues and growth rates have led giant companies to focus on users' passion for games. Consumers spent $101 billion in app stores and averaged three hours per day on their cell phones in 2018, a report showed. Turkish ventures in the gaming platform either made million-dollar breakthroughs or chose to stay in the game and grow by selling parts of games like Peak Games. However, Peak's recent job advertisements have been widely seen in new media and traditional media. Television screens, smartphone screens and streets were covered with Peak's campaign. Thus, we had a chat with Peak CEO Ömer İnönü, not about the campaign itself, but the reasons behind it, as well as the objectives of the company. Explaining why they focused on traditional media when they could have reached an educated audience that would respond to the advertisement only through social media or the Internet, İnönü said they wanted to reach out to everyone and show that there was an economy that could be realized not only by the people responding to job announcements but also by their families. They also wanted to show that worldwide ventures could emerge from Turkey. "So far, 50,000 people have applied. Perhaps for the first time, we wanted to show a brand new business area that could be on the agenda of the families who had seen it on social media and the Internet for the first time but not fully understood it," he said. "However, our main goal is to make sure everyone can have access to the growing value in the country. We want new people to join this beautiful family. We want to show that Turkey's intellectual accumulation can be successful by doing business in Turkey. That is all we want." We found out that Peak's growth plans are not limited to the gaming platform alone. So, what is next for the company? İnönü said artificial intelligence (AI) is changing many industries, adding they will begin to use AI more in the personalization of content according to the viewer or user. "Learning natural languages will be the second topic that will expand our domain. We know that we have skilled engineers in artificial intelligence. By bringing together these talented people, we are building a wonderful family environment where they will work for the common goal," he added. In fact, İnönü's content personalization is on the agenda of giants like Google and Facebook as well. The main problem of companies complaining about ad tracking is that these platforms fail to personalize. From here it is exciting to have companies that chase the same agenda with world giants. So, what are Peak's plans for the future? Although we insisted on this issue, İnönü did not breathe a word about it. We asked about the agenda of the studio, which undertook games as well as people from all cultures and created hundreds of episodes. He said that the studio team they just established has the right to speak about this. "We have a really great studio team. We do not pressure our studio to increase revenue. Depending on their natural working process, a new game may come at the end of 2019 or in 2020. We do pressure them to change their schedule. We have a world-class studio. We rely on their production capabilities," İnönü said. According to App Annie's 2018 Top 52 list, which prepares the world's most respected studies and reports on the global mobile application market, Peak ranked among the top income-generating app developers in the world. Peak, which ranked 37th among the companies generating the highest income from mobile applications in the world last year, managed to come 26th on this year's list. İnönü said that App Annie's 2018 Top 52 report listed the app-developing technology companies on the basis of their revenues from the App Store and Google Play platforms. "The global size of the mobile app market was $100 billion by 2018 and is expected to reach $157 billion in five years. As in the past year, Peak was also the only Turkey-based company in App Annie's list this year," he continued. "We are proud to be on the top in a list that does not feature companies from developed countries such as Germany, France and the U.K. Today, we reach hundreds of millions of users worldwide with our games. In addition, we continue to work on developing products in different areas of technology. Our goal is to be number one in the world in new mobile games and continue to successfully represent Turkey among the world giants with our new products." İşbank has opened the mobile payment method Pay with Maximum Mobile application to the use of Paynet payment services. The Pay with Maximum Mobile method allows Maximum Mobile users to quickly and safely complete their purchases by simply entering mobile phone numbers in e-commerce sites or mobile applications can be used by companies in the Paynet infrastructure. Within İşbank and Paynet cooperation, Maximum Mobile users will be able to pay quickly and safely from Paynet member businesses only by mobile phone number. İşbank Deputy General Manager Yalçın Sezen stressed that as the technology is constantly evolving and progressing to more advanced points in the digital age, they continue to work in a variety of ways to simplify new developing technologies and to offer new services that will make their customers' lives easier. "We also attach great importance to fintech collaborations to expand the e-commerce platforms where Maximum Mobile and Pay will be valid. We consider our cooperation with Paynet as a significant contribution to the value chain in the fintech ecosystem," he said. Paynet General Manager Bakay Korkmaz said that this cooperation will provide an easier shopping experience for Paynet member businesses and Maximum Mobile users, highlighting that with its entire organization, Paynet will continue to add new solutions to facilitate the payment and collection experience of businesses. Paynet Payment Services enables some 20,000 medium and large-scale businesses and dealers to easily manage their collection with financial and technological solutions. Thanks to the effective solutions created especially for the companies operating in the dealer network, the company mediates annual payment traffic worth TL 1.5 billion. Türk Telekom's venture capital company TT Ventures' investment in MentalUP, which produces special content that contributes to the mental development of children, has expanded the company's goals. Ventures in the field of education ensure the use of new generation educational technologies both in Turkey and in the world. MentalUP, which contributes to the development of a new generation education system with the technologies it uses in this field, signed an agreement with Türk Telekom's venture capital company TT Ventures for a 6.9 percent stake of the company. Since the agreement, the company has begun to raise its targets. Emre Özgündüz, one of the founders of MentalUP, said that together with his partner Reşit Doğan, this venture aims to contribute to children's mental development, while using technology in a beneficial way. "With Industry 4.0, there is a digital transformation in education. The use of game-based learning technologies in the world is rapidly spreading within the scope of studies aimed at Education 4.0," he said. "We have developed MentalUP in accordance with the principles and objectives of this new education system. While children play educational games on the platform without getting bored, the development of the child is followed day by day and reported to the parents." To keep user satisfaction at the highest level, Özgündüz said that they received scientific consultancy from important academic institutions such as Yıldız Technical University and University College London (UCL) and pointed out that among the new investors in MentalUP, there are investment companies such as IdaCapital and Capria, as well as TT Ventures. "We have always felt the support of Türk Telekom from the moment we joined the PILOT program. We are delighted to have reinforced this support with strong partnership. With the support of our new partners, we would further expand MentalUP in a very short time and make it a well-known brand all over the world," Özgündüz said. Özgündüz said that MentalUP was introduced to primary schools as a corporate practice in the academic year 2016-2017. "In the same year, we introduced our product to the end user via Internet and application stores," he noted. "Today, MentalUP has become an application used in more than 200 schools and sold in 56 countries in four different languages. With over 2 million downloads, more than 70,000 paid users, over 25,000 reviews and 4.8 points out of 5, it is among the most popular applications in its category."